STRATFORD-UPON-AVON, ENGLAND - Visitors to Shakespeare County Raceway during the annual Yanks Weekend could be forgiven for thinking they had stumbled into a regular Sunday meet at a typical American dragstrip - were it not for the British accents and license plates, that is, and the track name's incongruous association with the playwright, born a few miles down the road. Among the racecars present last spring were some hallmarks of Americana, including a '71 Chevrolet Camaro called the Bootlegger and a '57 Bel Air with "Honky Tonkin' " lettered on its doors. A Show 'n' Shine event featured dozens more Detroit products, restored to original condition and parked amid tents and campers on the grassy grounds of a former Royal Air Force base in Warwickshire. Even in this setting, which emphatically favored speed over style, Norman Dawood's 1949 Cadillac Series 62 Club Coupe drew a crowd of admirers. "I have other classic cars," said Mr. Dawood, who owns such quintessentially British automobiles as a 1966 Aston Martin DB6 and a 1963 Rolls-Royce Silver Cloud III. "But no other car gets anything like the looks that this one gets." When Mr. Dawood, a Londoner who runs a translating and subtitling business, saw the black fastback on eBay, listed by a seller in New Jersey, he bought it without hesitation. With characteristic understatement, Mr. Dawood admitted that the car was "a bit of an impulse purchase." Like many fans of the big American cars that British enthusiasts call Yank Tanks, Mr. Dawood was particularly drawn to Cadillacs from 1949, which was the second model year to feature the auto industry's pioneering foray into tailfins. Discreet compared with the towering appendages that arrived a decade later, the fins had been inspired by a clandestine look at the Lockheed P-38 Lightning, a fighter plane with twin tails, given to General Motors' designers working on the '48 models. It was the '49s, however, that were first to be fitted with a new 331-cubic-inch overhead-valve V-8, which became a standard-bearer for G.M. The engine's considerable power can still be felt on the highway, where Mr. Dawood's car easily keeps up with the flow of modern traffic. Mr. Dawood's Club Coupe, also known as a Sedanette, lacks power steering but has several options, including a Hydra-Matic transmission - which added $174 to the 1949 sticker price of $2,966 - as well as power windows and seats. Befitting a Cadillac, it is fitted with the modern conveniences of its day, including a cigar lighter, multiple ashtrays and enough headroom for a driver to wear his fedora. 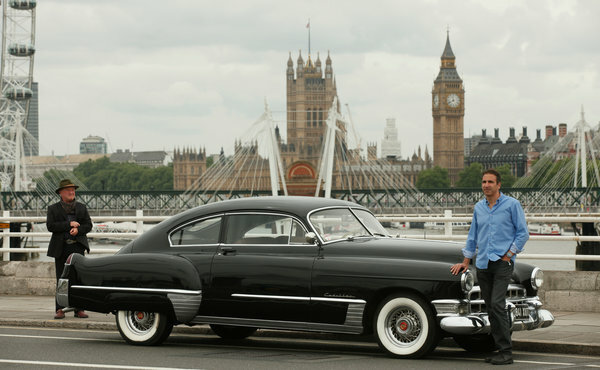 It is impractical to keep a behemoth '49 Cadillac in London, where compact cars ply narrow roads, so Mr. Dawood stores it here, about 100 miles to the northwest. That it was a sunny day, so uncharacteristic of a British spring, when he drove it to the Yanks Weekend, was fortunate, as the driver's window was stuck open, its power lift mechanism having given out. The window malfunction is emblematic of a series of small problems, some potentially incapacitating, that plague Mr. Dawood's Cadillac, and indeed many of the American classics increasingly bought on the Internet by British collectors. "The American car scene in the U.K. is just growing and growing because of the Internet," said John Pryor, president of the National Association of Street Clubs, a co-sponsor of Yanks Weekend. "More people are buying classic American cars now because they can fix them more easily, and we're now seeing dedicated shops opening up here," said Mr. Pryor, who recently traded in his 1959 Vauxhall Victor for a '56 Chevy. While the Cadillac was en route from the United States, Mr. Dawood found a copy of a British magazine, Classic American. "I couldn't believe my eyes," he said. "On the cover was a car identical to the one I'd just bought, belonging to some Scottish earl. The article was about a guy who specialized in restoring American cars, and I thought, 'This is brilliant. How lucky I am to find someone who already knows all about this exact one?' "
A few days after Yanks Weekend, typical British spring weather had returned, and Mr. Dawood was doing 65 miles per hour on the M4 highway, a frigid rain blowing in through the open window. He was on his way to see the specialist in the article, Mike Sargeant, 37, the owner of Tornado Automotive in Henley-on-Thames, about an hour west of London. The cars crammed into the Tornado garage, some of the greatest hits of American automotive design, were in various states of repair. On the lift sat a red 1958 Oldsmobile 88 convertible that Mr. Sargeant said was the first off the production line that year. Underneath it was Mr. Sargeant's 1936 Ford, a decrepit three-window coupe that he was rebuilding as a hot rod. A 1965 Ford Mustang, completely disassembled, sat near the shell of a Chevy El Camino. Mr. Sargeant is also restoring a Dodge Charger and a Plymouth Road Runner, both 1968 models, that he said belong to John Crichton-Stuart, the 7th Marquess of Bute, a former Formula One driver (known then as Johnny Dumfries) - and the owner of the 1949 Cadillac Mr. Dawood saw on the cover of Classic American. "I've got an interest in everything old," Mr. Sargeant said. "I like that '50s American kind of style, I like '50s rock 'n' roll, '50s rockabilly. I love the clothing, everything. I'm quite '50s-oriented, really." Mr. Sargeant said he was drawn to American cars by his father, John, who has a black '57 Chevy drag race car that he bought 14 years ago from a seller on an American air base in Britain, once a common source of vintage American cars. John Sargeant, who raced his Chevy at the Yanks Weekend, said the catalyst for his interest in drag racing and American cars was the 1964 British Drag Festival, which featured demonstration runs by the American drag racing star, Don Garlits. "You catch the bug real bad" he said. "I'll be 66 this year, and I'm still going at it." Trifive Chevys - the models from 1955, '56 and '57 - are perennial favorites in Britain. "They've been coming in for years and years, but now I deal with a lot more late '60s cars and '70s cars than I ever used to," said Mike Sargeant, who favors a slicked-back 1950's-style haircut and blue coveralls. "The muscle cars have become very popular. People are now looking to the rarer cars, the Road Runners, Challengers, the Barracudas, stuff like that." Cadillacs, however, are still an anomaly in Britain. "They are hard to restore, and parts are hard to find," Mr. Sargeant said as he disassembled the door to reach to the window mechanism of Mr. Dawood's '49. "The body parts are very complicated." For Mr. Sargeant, the Internet has been a blessing and a curse. "It's made things so much easier," he said. "Before, if you had an old car, you either had to repair what you had or you'd go to Hemmings Motor News and search for a part. It was a nightmare, you'd be phoning America, someone would mail you some photos in an envelope and you'd go, 'Yeah, that's the one,' and mail it back." Mr. Sargeant said he often felt like a doctor breaking bad news to a patient when a car arrived with unanticipated problems. "Norman paid a tremendous amount of money for this car, and the first person to see it in the country was me," he said. "He sent me the photos, and it looked stunning, but when I got it off the loader I was shocked. I'd never met Norman before, and I had to break the news to him that the car he bought was a complete mess," he said. The car was running, Mr. Sargeant said, but barely. The wiring harness was a fire hazard and had to be replaced. Mr. Sargeant's shop also rebuilt the brakes, as well as the front and rear suspensions. A "horrible sort of brown finish" on the dashboard and steering column was painted black. And then the problems with the windows started. When the window problem was solved, Mr. Dawood's Cadillac was back on the highway, the blustery weather at bay, again drawing stares and waves from other motorists as the car's modern-at-the-time heater gave the car's cavernous interior the cozy feel of a warm living room on a frosty day.